Au revoir to Phil Liggett and Paul Sherwen. This site’s received a number of comments today expressing sadness at the absence of Phil and Paul from ITV’s coverage of the race. One woman even went so far as to say that her husband would not be watching the race as a consequence, which seems oddly decisive. Personally, I feel that viewers have been getting diminishing returns from them both for a number of years and while I have no massive objection to them, I do think it’s disrespectful to the riders and a disservice to the public that neither bothers to learn how to pronounce foreign riders’ names properly. I don’t expect perfection, but have a stab, eh? Listening to them bat Jokkims and Jakkims between each other while talking about Joaquim Rodriguez – someone who has been competing professionally since 2001 – is actually pretty offensive. It is the end of an era and it’s okay to be a little sad, but life moves on. Hopefully people will develop just as much affection for ITV’s new commentary team of Ned Boulting and David Millar with the added benefit of halfway competent pronunciation. I think you are right. Millar is brilliant on team tactics, the effects of wind direction, and why riders do what they do. It’s a measure of how much more they have to say about the racing that this afternoon we have not been getting the endless facts about chateaux, abbeys etc, read from the crib sheet, which we used to get from Sherwin. I don’t mind a bit of irrelevant chateau information, but the time available for that kind of thing is still a good barometer. Boulting and Millar simply seem to have more to say about bike racing. I found Phil and Paul very interesting and the so called “endless facts about chateaux”, to which you ignorantly object, we’re actually in small doses that balanced what would otherwise be a rather mundane nose to the road, but to the seat, but out of the seat, head over the handle bars, foot on the pedal…ad nauseum… tedious dull one dimensional narrative. Something which is precisely the situation now and why I will not be paying uch attention to a sport that has fallen into the credibility basement in recent years. Can I suggest the whole reason for this change is to profile the TV coverage for betting and gambling advertising from the companies who continuously bombard the screen during other sporting events. It has nothing to do with sport or improved commentary and everything to do with money and the betting advertising revenue which for ITV has been a very lucrative income stream. You may welcome USA style bland sponsored TV but our European friends have a different more dignified attitude. Phil and Paul – go forth and prosper! I personally will now watch by direct satellite coverage. Ned Bolton has the 2nd most boring voice in cycling commentating . The first being David Miller. Of course ITV must develop new talent but commentators need to communicate across the age spectrum. Neither Boulting or Miller have what it takes. It’s a bit like when David Vine left Ski Sunday on BBC 2, it’s viewing figures went down hill. Commentators are key to the success of the programme so why not change them every few years and measure them against viewing figures. Let’s face it, some aspects of live coverage are boring so.it’s good that commentators can describe the often beautiful passing scenery with a bit of history thrown in. Could I do their job? No. But if I don’t like I can always find an alternative. By the way, many French commentators mispronounce foreign names as well. Bye for now ITV 4. Happy retirement Phil. does that include take performance enhancing drugs? I have just switched on and found out that the commentary team has been replaced. Utterly dejected, looking forward to cav taking the first stage,but without liggett and sherwin at the helm I’m sorry but I will not be watching this year, they were the main reason I watched the race, I loved there colourful commentaries. I never disliked them, but I’m really struggling to tally the depth of many people’s emotions with the banality of their work. Skipping the race because of their absence seems like boycotting your favourite restaurant because they’ve changed the napkins. It’s about upping the betting and gambling advertising on ITV and nothing else. They will dress it up as an improvement – and some viewers and a lot of profit motivated professional groups will window dress it, but it’s all about money and nothing else. They say it’s because they were never their commentators and ITV just had to buy into the US feed. This is why the two of them spent so long talking about American riders who were never going to achieve much. Gary Imlach points out that Liggett couldn’t even say ‘good morning’ to the UK audience because the US audience would wonder why he sounded like he was starting the broadcast again. I’m also struggling to watch the race, without Liggett in particular. Guess I should push myself a bit harder to enjoy the new commentators but somehow it just feels a whole lot more boring for me. I’m just a casual viewer and not a cyclist. Well it’s all about hunger – Ned needs the job and Paul Sherwen, being an oil and gold miner, can only talk with greater interest on boulders and geological features the riders traverse. David’s up to date and Phil’s out of date with rider experience. Jack it’s about upping the betting and gambling advertising from this sport on ITV. Surely you don’t think it has anything to do with improving the viewer experience – as the balance of comments even here suggest you are in a minority. The love of advertising and gambling ads is the name of the game….eh…in the UK that is. Just watched the first stage and surprised to find a different format, really not enjoying the commentary, Phil and Paul the voices of cycling…please bring them back. Exactly !! The commentary isn’t the same by a long way, i find it droning from both of them & uninteresting, bring back Phil & Paul !! You may be forgetting one thing here. Liggett and Sherwin had a fantastic chemistry when commentating and brought the tour to life. I do like Ned Boulton, but as a roving reporter not a commentator. The chemistry just isn’t there and lacks something apart from knowledge. It is just another example of ITV ruining a successful formula that at the moment of writing, just does not work. If it ain’t broke, don’t fix it! It’s about ITV reproducing the coverage to get more betting advertising which has found extremely lucrative in other sports events in recent years. Of course the mags and some groups will follow like sheep due to profit and being duped. If enough viewers show their dissatisfaction ITV will have to change. After all cycling is a bit of a laughing stock and Phil and Paul have offered some continuity during its volatile ups and downs. As for Miller…forgive me I maybe wrong, was he not implicated in doping awhile back? Bring back Phil and Paul without them it’s like Fish n Chips without salt and vinegar or L’escargot without garlic sauce. Merde! Difficult to throw stones at Millar. Liggett, remember called USADA a “nefarious local anti-doping agency” and defended Lance Armstrong long after anyone else had accepted what he’d done. They were pretty close. I just signed up for the Cycling package from NBCGold Sports. 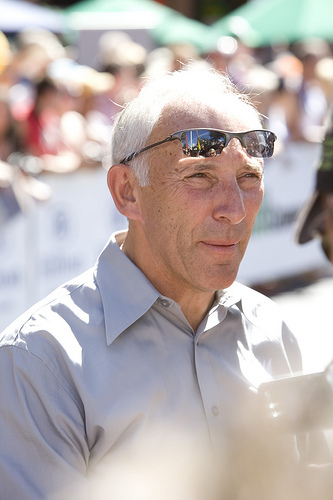 I had fond memories for July of each year of listening and watching a tour of France with some cycling thrown in with Phil Liggett and Paul Sherwen. I have to say that today’s commentators and the way it is now packaged is hopeless. I won’t renew for next year. Antipodeans who are now commentating on can’t speak English they speak some other similar language but it isn’t English. If you are knowledgeable of language you’ll know that in the UK there are many accents but I know if I visit a pub in Scotland I’m going to have trouble listening to a local conversation. The rest of the world will have the same problem with these Antipodeans. They are terrible. They sound completely wooden and they can’t pronounce most of the names of the Chateaux. Its like trying to watch the LA Dodgers without Vin Scully. No Phil and Paul – at first I hoped it was all a mistake and they would pop up later in the commentary. Nothing against Ned and David but I miss Phil and Paul’s banter, the warmth of their voices and I’m finding that I want to know which bridge is crossing which river and the history of the towns, villages and chateaux. The Tour de France is unique and is about more than sweaty men in lycra. Please ITV, enough is enough – bring them back! Patricia, sorry to break your hopes, but this is obviously a ploy to reprofile the coverage to garner betting and gambling advertising – something that is a lucrative income for ITV on other sports events. we all know who the big betting firms are due to their relentless adverts elsewhere. Also it’s a bit rich putting a self confessed suspended doping cyclist in charge while blaming Phil for too easy going attitude towards Armstrong. Is this what they mean by best of British – Millar. I’m not trying to “win” an argument here. I’m just trying to provide balance. Whatever my own position – and I’m honestly pretty ambivalent – there are a number of people who have found the continued use of Liggett and Sherwen questionable due to their close dealings with Armstrong, among other things. Bring back Phil & Paul . They were a brilliant partnership. Millars voice is monotone, sooo boring. Ned is brilliant. But his forte is a roving reporter. I can’t 3 weeks of Millar! Bring back Phil and Paul. The new team are just not so good. The new commentary team is flat and boring – especially David Millar. It reminds me of that first football commentary by Phil Neville. Yes sometimes Sherwen and Liggett were prone to the odd verbal gaffe – but they were lively, enthusiastic and entertaining. Boulting and Millar are dull as ditch water. Why not just say sorry and bring back the old team who are still working with appreciation elsewhere – bring ’em back. Ned go back to the odd 5 minutes. We still have Phil and Paul doing the commentary for the Australian coverage. The low level racism behind not bothering to learn how to pronounce those foreigners names sits well with Australian society (this despite the race airing on the special broadcasting service which heavily features foreign language programming). There seem to be an awful lot of people here in Britain who yearn for the days when difficult foreign names were good and anglicised. Wolf, if you think this is racism rather than just unintentional mumblings, you need to get out more. On the whole you can’t have a career like Liggett if you are remotely racist. In fact the opposite is true…many times you will notice they have a great love for the country that hosts the Tour and the rather international background of the participants. You clearly have been deaf and dumb to this. But how about a self confessed Dover doing the commentary…is that acceptable? Ned and Chris were very good at the funnies, 3 commentators would be too much, Phil and Paul are the perfect combination, they made you feel as if you were on a bike and in the race. Tried watching last couple days but cant get into it, sorry but ITV need to reinstate Phil and Paul please. i’m sad they have been replaced . Phil Liggets and Paul Sherwens commentary were part and parcel to the ITV coverage. yes, we miss you boys but giving boulting and miller a chance. phil and paul are a hard act to follow soooo good with all their years of experience, witticisms, history and geography of france, and the cycling too. but if they are broadcasting to australia how can we tune in to this channel? anyone know please? Not overly fussed, to be honest. Sherwen & Liggett used to annoy me by either wrongly identifying the rider in shot, mispronouncing their name, (or both), and I can take or leave the chateau chat – but much as I love Ned I do worry that the inclusion of David Millar makes it less likely that doping infractions incurred by certain members of the peloton will be mentioned on commentary. I hope I’m wrong. However…….should itv4 dare to do away with the absolutely superb Gary Imlach/Chris Boardman combo I will be organising petitions and taking to the streets in protest! Imlach is a joy – drier than sandpaper and pithier than an old satsuma. I’d suggest the opposite. Millar’s like the guy who gives up smoking and then won’t stop lecturing people about it. I think he’ll be far more likely to call people out on doping than Liggett and Sherwen ever were. I mean pretty much everyone would make a bigger deal of that kind of thing than Phil and Paul, but you know what I mean. Imlach is basically perfect. Boardman too. I read your road.cc piece after I’d posted above – and also scrolled through the comments section. As a fairly recent convert to the church of TdF, I wasn’t aware of the criticism levelled at Messrs. Liggett & Sherwen’s robust defence of a certain disgraced US cyclist – so stand corrected, and understand exactly what you’re getting at! And quite by chance, David Millar did field a question about doping yesterday on ITV’s highlights show. It is just so boring now, the helicopter circles around some fantastic sights and Mr Miller just keeps on with his tactics and completely ignores where they are etc etc. There is no link to the cyclists or their history, the link to the racing cars is really irritating because of the radio interference, it has lost its appeal! We have watched it for years but I think we won’t bother any longer! I have watched The Tour de France for the last 30 years or so on both Channel 4 & ITV but this year has been awful mainle due to the commentators. David Millar, a self confessed cheat when he knowingly took performance enhancing drugs is a terrible commentator and David Friebe ( or should that be FreeBee?!!) is also a poor substitute for the previously excellent team. ITV must have lost thousands of viewers as a result of this years coverage. Please bring back Phil Liggett & Paul Sherwen or get another commentary team that can emulate there excellent coverage for the 2017 Tour. The general feeling seems to be that they commentate well on the racing, but are weak when it comes to background info and atmosphere. Do you not thing Boulting and Millar might improve at the latter given time? This is their first Tour after all? Same with Daniel Friebe. I’ve heard him on podcasts and speaking naturally and unscripted, he’s very good. He’s also a good writer. I think he just needs a bit of time to find his style on TV. He’s very stilted at the minute. I read a comment elsewhere about this and the poster made a good point that for die-hard cycling fans, the consensus was that Phil and Paul had passed their sell-by-date, but for casual cycling fans, or more specifically folks who really only watch the Tour, then Phil and Paul are part of it. I can see where they are coming from with this, and sadly I fall into the latter camp (and hasten to add, not saying everyone falls into one or the other or that 0ne is right and one is wrong!) Because of this, I’ve not watched this year 🙁 I have tried, honest! I like Ned, but he seems to be trying too hard to be “jolly” (he sounds like Smashie, or was it Nicey? Or perhaps Cliff Richard?) and David Millar, well he clearly knows his stuff, but he is so emotionless. I fell asleep! I tried to find a way to get NBC here in the UK, or stream the sound at least, but both were non-starters. Oh well. Life moves on. I guess a lot of folks are happy with the changes.. I don’t enjoy the new commentators at all. The Tour de France was always so nice to watch with the stories of the towns and cathedrals. Really not so nice anymore! Please bring the old commentators back!